Wages of Rebellion is muck-raking at its finest. But muck-raking is not enough. It is not enough to tell readers of the terrible things that are happening in the world. We know. What we need is a call to arms: an incitement to do our part to make the world a better place. Hedges failed to do that. 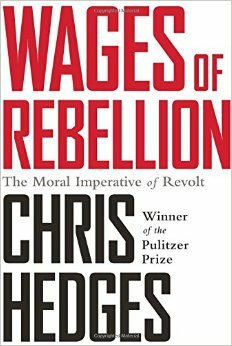 With the subheading: The Moral Imperative of Revolt, I expected a philosophical treatise on why we must all revolt. Instead, I was hammered by descriptions of the extensive electronic surveillance that ordinary citizens are now subjected to, of the deplorable conditions of prisons, of the heavy sentences those such as Assange and Manning have faced for trying to fight the system. With all the terrible consequences that a morally sound person must fact, I'm left, not with a call to arms, but an overwhelming sense of defeat. I felt like Hedges could have done so much more: he has so much experience with so many revolutions. During the introduction, he mentioned how "the Russian Revolution inspired socialist uprisings in Germany, Italy, and Hungary.. and fueled the imagination of radical movements in the United States as well as the Indian independence movement led by Mohandas Karamchand Gandhi." I wanted more of that -- more comprehensive analysis of the interconnections between global events. Hedges seems to decry violence. He paraphrases Havel as saying, "The ability of the movement to overthrow the corporate state depends on.. utter and complete transparency, and a rigid adherence to nonviolence, including respect for private property. Hedges also writes that the longer courts ignore violence to Blacks, "the more likely become random and violent acts of retaliation, which the state will label terrorism and use to justify odious forms of repression." But despite those two strong passages, he didn't make his point clearly enough. With all the descriptions of violence, he needed to speak up more as to how we can respond instead. This book was certainly engaging and well-written. But I would recommend Naomi Klein's This Changes Everything instead as it also discusses terrible events we're facing day, but gives us more hope on how to deal with it all.